A big thanks to everyone who participated in last Sunday's get well campaign for Diana (quilt store owner and my neighbor at the Niles). The Wizard of Oz box filled with get well wishes brought sentimental tears of joy to her eyes and a great deal of gratitude to her heart - exactly what the doctor prescribed for healing. I also want to thank everyone who joined Julie Nutting for her classes last Saturday. Your participation made her classes a great success. You also did a great job at encouraging Julie to come back to teach! 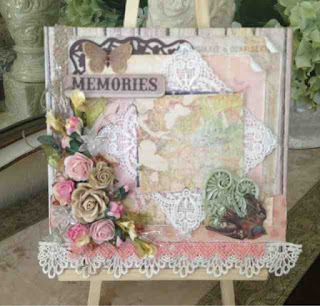 Once her new collection of girl stamps from Prima hit the market we will book a teaching date for Julie at TPBP. As a thank you to my wonderful loyal customers, we will have a Memorial Day Sale starting Sat, May 25 and ending Mon, May 27 at midnight. For every $60 purchase you will get $10 off your total purchase. Consignment and class purchases will not be included in the $60 total. Online customers may use coupon code "MemorialTPBP" in our Etsy shop. You have asked for it and we now have gift certificatesavailable for purchase in the store. If you are an online shopper, you may use the gift certificate function provided by Etsy. We will host our first public crop on Friday, June 7, 5pm - 12am. The cost will be $5 per person. Please call the store to reserve your seat at the crop table. We will also host day croppers during our open hourswhen we don't have any classes or events going on. The day crop cost is $5 or free with your $30 purchase the day that you crop. Please call to reserve a spot. TPBP will host an Artist Trading Card (ATC) Swap for our in-store shoppers. ATCs are a fun way to share your art with other artists while also creating a collection of works from other artists. When you visit the store, let me know that you'd like to swap ATCs and we will, it's that simple! If you are wondering what the heck an ATC is, follow thislink for a definition, instructions and a video. I'm having fun making my ATCs and can't wait to see what you bring in to swap. From hot air balloons to tea cups, we have a number ofchipboard pieces that we sell online and now in our brick & mortar store as well. Take a look at our online selection, decide what you would like and give the store a call so that we can be sure to cut exactly what you want. Now that the dust has settled and we've been open for a couple of months, I have a better idea of the stores hours that work best for my customers. Because of this I'm making a change to our Sunday hours. On Sundays we will now be open 11am to 5pm. Details about these and our other classes can be found on our blog or just call the store to sign-up. I know that was a lot of information, but we have a lot going on here at TPBP. I hope you are as excited as I am about all that is new in the shop. I look forward to seeing you in the shop and hope you enjoy this week's Creative Inspiration from our Design Team. Janet's altered tea cup and saucer would be the most adorable center piece at any tea party, we think even Alice would agree to that. Janet's swap partner is in for a big treat! Today, Char is serving up a tea themed project! 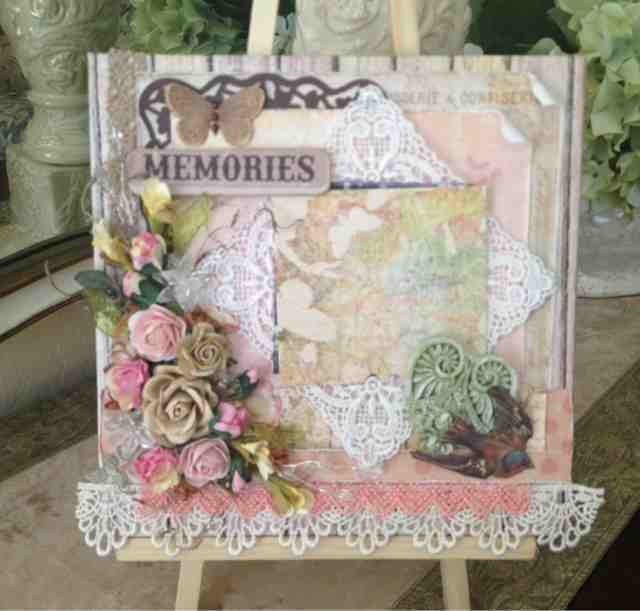 Her beautifully embellished picture frame will be a happy place for any picture. Can you imagine the recipients joy when she receives Rosanne's handmade trinket box? I can imagine that it would nearly bring tears to her daughter's eyes. It is certainly made with lots of love, and, of course, beautiful embellishments from TPBP.